Earlier in the week we were lucky enough to escape the heat for half an hour in the plush surrounds of the Adelaide Hilton to sit down and chat with Jimmy Whelan. Arguably some of the hottest young talent in Australian cycling (NO pressure) going around, this freshly blooded and rather tall EF Education First Pro Cycling rider gifted us half an hour to talk about his journey to date, the associated learning curves, food, coffee, fashion, gifs but importantly: what he loves about the Tour Down Under. How has your week been going so far? This rise you’ve had through the sport in just a few years has been pretty rapid, have you had any chance to sit back and take everything in? It’s all been a bit of a rush for sure, it only felt like yesterday that I was doing university, working in a Mexican restaurant and doing cycling at the time to stay fit so to think that I’ve turned around there from working in that Mexican restaurant for 40 hours a week to 2 years later where it’s now my job to be a cyclist, it’s ridiculous but it’s definitely meant I’ve had to grow up a lot. Were there any hurdles you had to overcome making that transition from running into cycling? Physiologically it’s not an issue, it’s all pretty straight forward as an athlete, the training is no worries. The biggest thing that threw me was that I had to put my planning career on pause which was just starting up. While I was working in that Mexican restaurant I got offered a proper, really competitive planning job, so to drop that and say I want to become a professional cyclist and throw myself in the deep end for 18 months was mentally the hardest challenge. But you can get over that and you’ve still got to learn how to ride a bike, how to ride in the bunch, then across the Europe and learn how to ride in Belgium, the French Alps, Livigno. I’ve had some good experiences, and I’ve just been trying to soak everything up and be a fast learner. Is the racing over in Europe as challenging as a lot of the journalists make it out to be? In Belgium definitely because you’ve got narrow roads with heaps of corners which is pretty hectic. In Livigno obviously you’ve got the climbs and you’ve got these descents where you really have to learn how to ride downhill. Everybody talks about riding up the hill as being the challenge, not so much the issue for me, but going down it is another story. For a lot of the guys who transition from other sports thats the one thing that takes some time to hone in those kinds of skills, and it’s so important because I’m putting my life at risk if I can’t control my bike properly. A big moment for you was taking the win at the U23 Flanders, a win that kind of caught most people in the cycling world by surprise. What did it feel like in the aftermath of that win? Initially before I headed over people were critical of my paying my way to get over to Belgium in the first place, all to do a race that I didn’t know anything about, and based off previous history I’d probably get smashed because I didn’t know the roads, didn’t know the riders and it’s almost like a completely different sport over there. Obviously when I came across the line in first I didn’t quite realise how much of a big deal that was, and I didn’t even consider the idea that I could go pro from that. My agent was able to sort out a contract from that result then and there and I guess because of the nature of the result being my first race in Europe it did get a fair bit of attention from Euro journalists, and they were surprised when after the race I said it was my first European race. Whenever I said that you could always see them writing it down, then that was usually the headline. It was cool, but I didn’t really notice how big of a deal it was until I got home. In the first instalment of the EF x Rapha Gone Racing, you’ve got Mitch (Docker) and Lachy (Morton) essentially putting you on their shoulders for the road nats. What did it feel like to have two pretty big names in Australian cycling in your corner for a race like that so early in your career? It was a big deal for me seeing them ride for me, really daunting to be honest because I knew that they were putting their races on the line to essentially see me go up the road and try make the race. That was pretty nerve-wracking but I just took it as a compliment and knew that they were putting faith in me and that I was good enough. Unfortunately the last lap was not what was planned but it was pretty cool to have those guys ride for me, particularly those two guys who are really popular and well respected. Lining up for your first World Tour race must be exciting, what’s your aim for the week? I’ve got so much to learn so I’m just constantly cycling through things that I’ve been picking up on over the last few days. My main race will be going up Corkscrew and Willunga, whether that’s to help Mike Woods either by being a decoy or to just play my role in the hills. On the flat stages I’ll be there more for support, getting bottles and things, staying out of trouble, making sure I don’t get caught by the time gaps at the finishes, but definitely to be Woodsy’s right hand man should he be racing for the win. What do you love most about the Tour Down Under? For me I love it because it brings cycling to a country that doesn’t know much about the sport. I think it’s cool to see locals and all the Australian’s on the side of the road who wouldn’t usually follow cycling that get so involved in it. Obviously I haven’t raced in a proper pro race where these crowds are pretty standard, but it’s pretty cool engaging with the community, seeing how excited the little kids get because I was one of those six years ago and I’ve come up here for the last few years. I just think it’s great for Australian cycling. It doesn’t take a toll, but I guess that’s what training is for. I have the luxury of having the entire day and week to get ready for something like this. You can consider I work all day and all through the week whether training on the bike or for example I’ve also been doing sauna’s 5 times a week which has helped with the heat. Yesterday while it was all hot, my body was actually quite controlled and I reacted to it quite well, and even my heart rate was pretty normal. It’s definitely a bit different when you’re a professional and you have all day to prepare for it and you can really get that good if you put the effort in, but the biggest thing is time. The release blew up the cycling corner of the internet when it dropped, but what are your thoughts on the new team kit? Pretty sick. I actually didn’t see it until the night before when they gave me my suitcase to try it on to make sure it all fitted and when I tried it on, I didn’t think it would like that, I didn’t think it would be that bold. It also isn’t tacky, in person it looks really smart, and particularly when you’re all in a group and you have the bikes and the helmets and the glasses. There was a lot of hype when it was released and I remember walking out of the elevator here with it on for the first time that morning, and it hadn’t really been publicly seen and everyone in the Hilton sort of turned and looked and point and it was really cool. I felt like I was a bit of a rockstars but it was just the kit not me. Does being in such a red hot kit give you bonus motivation to get those results whether its an overall win or the KOM, knowing that there will be some sick photos along the way? Obviously there’s huge hype around the kit and around what the team is trying to do in that it’s sort of challenging the norm of what a cycling team should be, but now theres the responsibility to turn this hype and this casual-ness you could say into a high performance team where we get some wins. We want a few victories on the hills whether that be through Woodsy or wherever we’re going to be looking for some good results. One of the big things from the announcement and vision of the team is the inclusion of these alternative races, do you have any marked down for this year? For myself, the team it’s not a priority of mine, I’ve gotta be learning to ride in UCI races because my biggest flaw at the moment is to learn how to ride in the professional bunch. For the other guys like Lachy and a few of the American guys on the team, they’re fighting for a few spots to some of the events. I don’t know a lot about them to be honest because I haven’t really been told about them and it’s not really my space, but hopefully in a few years I’ll get a chance to take them on. We’ve got the casual kit the team has supplied us which we’re wearing most of the time, but for most fashionable I’ll say Alberto Bettiol. His personality and the way he wears his things and the way he goes about things is really cool. Taylor Phinney too, he’s pretty popular for what he wears, and I really like what Lachy does, I think it’s really personal. It’s really refreshing that they’re not your typical pro cyclist robot so to speak, because theres plenty of those going, but we need more of the Taylor’s and Lachy’s in cycling. I think in our case with EF and Rapha it’s the perfect platform to kind of become fashionable, each rider has their own look and the Rapha stuff looks pretty sick complimenting that. What 3 songs have you been bumping this week? I actually haven’t had time to listen to any music at all. Normally I always am, but not this week, not yet. I know that up at the food buffet they have the same 6 or 7 songs but just club music so that’s really the only music I’ve been listening to unfortunately. Usually I have one day off every two to three weeks, so ideal rest day has no exercise in the morning, catch up with someone for coffee or breakfast, maybe a mate I haven’t seen in a while, then maybe go do some normal human things. Go shopping, just chill out, switch off and watch some Netflix, or take the dog out for a walk. I always get a long black or a batch brew. My favourite coffee place in Melbourne would have to be Maker Fine Coffee. Their coffee is amazing, I really like the people that work there, they have a cycling team and they’re always engaging with the cycling community. This is the first time I’ve grown one to be honest. I’ve heard before that you can get these creams that actually encourages hair growth, but I don’t know if that will do anything. For this here, this took me by surprise and it’s only taken me 2 weeks. 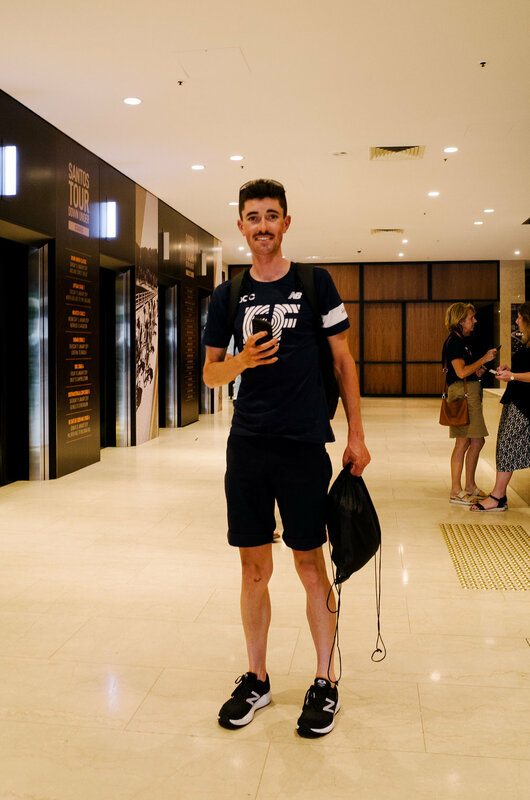 We got an email a week before nationals from Mitch Docker saying you have to grow a moustache for Rapha, then my mum hated it but it actually looks okay and it’s still growing. But yeah, google the cream for facial hair. They give me the shits a little bit. I don’t know what it is, like I can’t pinpoint it, but around this time last year some of my mates were putting cycling photos up online of me whether that be at grits or the Flanders win for example and they would put gifs all over me and thought it was amusing because they knew I hated it. So we’ve got this chat where they just sent me photos of all sorts of gif’s and I’d just get triggered by them, but it’s just one of those things where I just don’t rate them. What’s next up for you? We’ve got all the remaining Melbourne races, Cadel Evans Great Ocean Road Race and Race Melbourne then onto the Sun Tour. Then it all kicks off for the European season where I head over on the 7th February and my first race is Haut Var on the 22nd February in the south of France, then Coppi Bartali in Italy, but my biggest one dayer and the one I’m most looking forward to is Liege Bastogne Liege. After that I’ve got the Dauphine which will be my biggest stage race, so that’s pretty damn cool. I’m sure I’ll be pinching myself when I’m at the start line for those races.